The Ballymaloe Cookery Course is a fantastic book containing 1175 recipes, 370 variations and more than 100 basic skills from staple recipes that are quick and easy, to master recipes with twists to change them and more complex challenging dishes. There are many irish recipes and international recipes also, it’s more a culinary bible than a book and would be well placed in any kitchen. It is written by Darina Allen, the co-founder and one of the teacher’s at the Ballymaloe Cookery School in Cork, Ireland. She’s the Irish answer to Delia Smith and a promoter of slow food and traditional cooking techniques. The cookery school is famous and has been the first step for many in a culinary career. It’s located in the middle of its own 100-acre organic farm outside Cork City, in an idyllic location near the coast.I am offering this cookbook as part of the prize I have donated for Menu for Hope 4 so, I thought that I should cook something from it to show you how lovely it is. I have chosen something very simple and quick as I had very little time yesterday. It was delicious, very rich and flavoursome, a perfect winter soup. The devil is in the detail as always, covering the potato and onion with the paper while it sweats really concentrates the flavour, be sure to do it. I used a chicken stock but a nice rich veggie stock would be great with this too, I just used what I had to hand. Peel and chop the onions and potatoes into small dice, about 1 cm. Melt the butter in a heavy saucepan. As soon as it foams, add the onions and potatoes, stir until they are coated with the butter. Add the thyme leaves, season with S&P. Place a paper lid (I used baking paper) on top of the vegetables directly to keep in the steam. Cover the saucepan with a tight fitting lid and sweat on a low heat for 10 minutes or so. The potatoes and onions should be soft but not coloured. Add the stock, bring it to the boil and simmer until the potatoes are cooked – about 5-8 minutes. Liquidise the soup and add a little cream or creamy milk. Taste and correct the seasoning if necessary. Serve, sprinkled with thyme leaves. For information on how to donate and enter a raffle to win this book, please see the Menu for Hope – Raffle announcement & prize post. Happy Halloween! I love festive occasions, any excuse for a bit of fun and a party. Halloween was one of my favourites as a child. We were always on mid term break and so had ample time to fashion costumes, from, *cough*, the most humble of substances. Witches costume from a refuse sack? No problem! I blame Bosco (all you Irish readers can nod your head). Pumpkins were never something we could get our hands on in the wilds of Waterford, so we use to raid the local sugar beet fields and fashion jack-o-lanterns out of them. I wish I could communicate using words the foul stench of burning sugar beet, but we persevered and carried them from house to house. There was a big band of siblings, cousins and neighbours that would march for a mile or so, stopping at the sporadic houses, singing in 3 parts everything we knew – stuff from TV (yes, Bosco), school, church, you name it. We didn’t want monkey nuts, we despised them, just money or sweets please, thank you very much. It’s a wonder they answered the door to the refuse sack clad, sugar beet wielding, singing children on a dark and cold Halloween night! So, what did we eat? Sweets, lots of them. I’ve kept up that tradition here today, I’ve eaten way too many jelly snakes and percy pigs, but it had to be done. There was also apple bobbing, and putting a grape on top of a pile of flour and nudging the flour without knocking the grape… and lots more I can’t remember now. Certainly not pumpkin anyway, but as an adult, I eat alot of it this time of year and today is one of those days. So, criteria for a halloween dish? Preferably pumpkin-y, should be spicy, and orange would be good (pumpkin helps!). I am not at home tonight so settled on a halloween lunch of pumpkin and celeriac soup with chilli which I made last night for today. Pumpkin & Celeriac are a great match. Both really good for you too, pumpkins are full of beta-carotene, potassium, vitamin C, calcium and fiber and celeriac is rich in vitamin C, phosphorus & potassium. Their texture in soups is wonderful, so smooth. Chilli is great with pumpkin, it livens the flavour and adds that spice we want. Any pumpkin or squash will work, preferably an orange fleshed one, butternut squash, onion squash or pumpkin are great. I add red split lentils to thicken the soup and to provide some protein, garlic and onions as a base, and some good light stock, vegetable or chicken are great. This is a really quick soup and takes care of itself as most soups do. I am a bit greedy when it comes to soup and am like a pig at the trough swilling bowl after bowl, so, it’s difficult to estimate portion sizes but I would think that this would serve 6 normal people. Summer is here! At long last! Sun, sandals, walks along the South Bank, maybe even some picnics. And last night a bright summery soup. This soup is so bright and cheerful, a twist on my usual carrot & orange inspired by an indian dal. I toyed with the idea of adding a tarka (spices tempered in oil added to a dal before serving) but decided the simpler and lighter the better. Lemon and coriander work so well together, as do carrots & coriander so I thought this should work, and it did. I like lemon, but I don’t like it to overpower so I added just a couple of tablespoons, you may want to add more or less – I suggest you do to taste. Sauté the leeks for a good ten minutes or so over a low heat. Add the carrots, I like to sauté these for as long as possible to intensify the flavour, 10 minutes would do but I left them there for 30, sweating away with an occasional stir. Add your stock and lentils, bring to the boil and simmer for 15 minutes. Add the coriander and púree. Season to taste with S&P and add the lemon juice to taste. Another quick lunch was required and I fancied some wholesome soup. I wanted something healthy so lentils and beans sounded good. I had also recently pilfered some rosemary from a friends garden so wanted to put that in. I toyed with the idea of making a chorizo, tomato, red pepper & butter bean soup but I’ve been eating so much chorizo lately that I thought that I should give those poor Spanish pigs a break, they’re probably having nightmares about me. I did use Spanish beans though, the giant Spanish butter beans – Judion de la Granja. These are huge white butter beans, quite creamy in texture. They can be hard to get and pricey so feel free to replace with butter beans, it will still be very nice, I just like using different ingredients and the drama of the large beans. If you do want them El Navarrico do them in jars and you can get them in most Spanish deli’s. You can also get them dry at Brindisa in Borough or Exmouth Market in London. Garcia’s in Notting Hill sell the jarred ones as do most Spanish deli’s, this just happens to be the one I know well. Back to the soup. It’s important to use a good stock here. The soup is quite brothy and the stock delivers much of the flavour. You can use chicken or vegetable and preferably homemade. Mine was vegetable made by boiling some carrots, garlic, cloves, celery, leek, rosemary, just bits I had in the fridge really. As long as you think the veg will complement the veg in your soup it will work well. Stock requires alot of veg so make sure you use plenty. Alternatively, just be sure to use a good shop bought stock. The recipe follows. I haven’t been feeling very well recently so haven’t been cooking. Today I started again with something very gentle, almost medicinal, a really tasty courgette and sweetcorn soup. Both main ingredients are reasonably delicate and result in quite a creamy soup which is a pleasure to eat and perfect for tender tums. It’s also seasonal so the ingredients are at their best having grown naturally. I have a really lovely book which I have had for over 10 years and which has travelled with me from Ireland to London and through my many house moves since – The Kitchen Pharmacy by Rose Eliott & Carlo de Pauli. Both authors have great credentials, Rose Eliot is a renowned vegetarian food writer and Carol de Pauli is the Principal of the Institute of Traditional Herbal Medicine & Aromatherapy and the Director of the British and European Osteopathic Association. 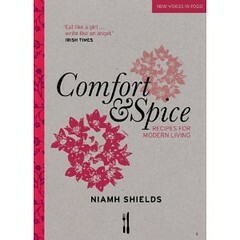 Their book associates specific foods with ailments and offers recipes for these which if nothing else provide comfort. You are what you eat, a cliché but so true. For a few years, if this were explicitly true, I was in danger of turning into a bag of crisps! Having already decided to buy a big bag of courgettes at the market I decided I’d take a look at the Kitchen Pharmacy and see how courgettes might benefit me and, sure enough, they have cooling, anti-inflammatory and anti-spasmodic properties in your intestine which makes perfect sense considering that I am recovering from a nasty intestinal infection. Your body does remember foods and other ingested items and what it likes and it doesn’t like. I think my poor tum remembered how nice courgettes were to it before and requested them. Incidentally, this is why, sometimes when something doesn’t agree with you you find out the second time you eat it not the first. I was once a physiologist (I have a degree in physiology) and know this to be true but to my shame the precise scientific detail escapes me now. Eatlikeagirl’s Roast butternut squash, coconut & chilli soup was chosen as photo of the week on the Guardians Food Blog – Word of Mouth. This isn’t a quick dish like my normal Monday-Friday dishes. It takes a little time as I like to roast the butternut squash. Roasting intensifies the flavour and leaves a beautiful sweet syrup on the roasting tray which I put in my soup. I also add chilli and herbs when roasting it which on it’s own makes a lovely side dish. Any pumpkin/squash will do, I just happened to have a butternut squash. The smaller the better, the smaller ones have a better flavour, large pumpkins tend to have more water. We cooked a giant pumpkin some years ago and while it was great fun and a challenge to use all of it, it just didn’t have that lovely sweet flavour of the smaller ones. I would love another one though. A friends neighbour grows them on his allotment. It was so big it had to be delivered in an old cement bag, it wouldn’t fit in a normal refuse sack. And we only got a quarter of the pumpkin that time. It’s been a few days since I’ve posted anything but I’ve got a few things to post from the weekend. I’ll start with a pasta dish that I made yesterday, one of my comfort food favourites. I tend to make this by eye and by tastebud, adjusting it as I go so feel free to be flexible with the recipe. My mood also affects it, sometimes I like it very soup-y with alot of stock, other times I prefer the pasta to be the star of the show. Yesterday was a pasta day! The weekend just past was filled with trips to farmers markets in an attempt to buy some sprue asapragus. Unfortunately, all trips were unsuccessful but I did get some great produce in the shape of onion squash, baby carrots, mixed wild mushrooms, garlic chives, shallots and white & green asparagus. Next week, I’ll get down there earlier and get the sprue before it sells out! I am very happy with my haul though and can’t wait to tuck in and start experimenting with all of these goodies. Having spent the day wandering I wanted something quick, light and tasty last night using some of my farmers market goodies. I decided on a pasta soup using the young carrots and squash as main ingredients. It was delicious and light and is definitely one to reproduce over the summer using seasonal vegetables like broad beans and peas. The recipe is a rough guide, add more or less of ingredients according to your preference, it’s really flexible. Sauté the shallots in olive until translucent. Add the garlic and stir for about 30 seconds. Dice the carrots and squash and add to the garlic and shallots. Sauté for about 4-5 minutes taking care not to burn the garlic. Add the stock and lentils and simmer for 5 minutes or so. Add the macaroni and cook for 10 minutes or so until al dente. Stir in 2/3 of the parsley. Serve in big bowls with the rest of the parsley and some chopped garlic chives as a garnish. Be warned, the garlic chives are extremely garlicky! I love them but if you are not a big fan of garlic use a small amount or use spring onions instead.